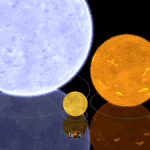 This post was originally published on December 24, 2009. It was substantially revised and re-posted on August 17, 2015. It’s on an-trend name from the night sky and the silver screen. 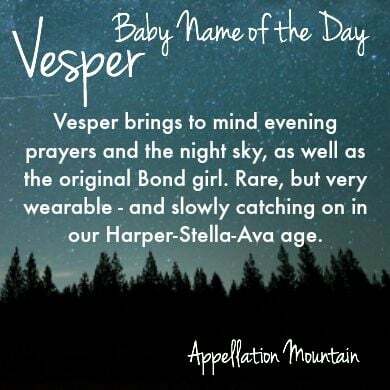 Thanks to Shelby for suggesting Vesper as our Baby Name of the Day. Ian Fleming introduced James Bond in 1953’s Casino Royale. He wrote more than a dozen novels about the suave secret agent. Vesper Lynd was created by Fleming for Bond’s first adventure. Her name is a play on West Berlin. In Casino Royale, she’s a double agent – as divided as the city – but Vesper ultimately proves herself loyal to James.The book was adapted for the big screen for the second time in 2006, with Eva Green as the double agent. It’s said that Fleming based Vesper on a real life spy, Poland’s Krystyna Skarbek, a woman he knew in her later years. Resourceful Skarbek organized couriers to bring intelligence reports from Warsaw to Budapest during World War II. She escaped the Gestapo in Hungary. In France, she once cajoled, threatened and bribed Gestapo agents into releasing two of her male colleagues. Her real life story is arguably more intriguing than the fictional character she inspired. Bond girl aside, Vesper is the Latin term for the evening star, which was actually the planet Venus. But wait, you say, the Roman god Vesper is masculine. In Greek, he’s Hespeus. In both traditions, he’s the son of the dawn, the brother of the morning star. Should we cede Vesper to the boys? Maybe. But there are also the Hesperides, nymphs of the sunset and the evening. The Greeks believed that they lived in a garden somewhere on the edge of the world. Sometimes there are just three; other accounts list more. Heracles visited the garden for his eleventh labor, to steal the apples they tended. The Hesperides became popular in Renaissance art, and their garden is mentioned by everyone from Milton to Shakespeare. Vespers – add an ‘s’ – is also known as evensong, an evening prayer service in several religious traditions. Mozart and Vivaldi are among those who have composed musical accompaniments. Evening prayer services date back to the earliest days of the church in the ancient world. St. Benedict may have been the first to use the term, back in the sixth century. Specifics vary over the centuries and by faith tradition, but it has traditionally been one of the more important and solemn prayer services of the day. There have been a handful of newborn boys and girls given the name over the years. But Vesper’s use has recently picked up. 35 girls were given the name in 2013, and 52 in 2014 – a new high. 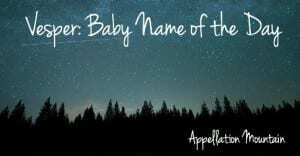 Parents love a name with meaning, especially a subtle, spiritual one. With Harper and Piper on the rise, Vesper’s -r ending is stylish. We’re also fans of the letter V, from Ava and Olivia to Everly and Vivienne. Nature names, including those from the night sky, are very much in vogue. Lloyd Alexander gave the name to the adventurous orphan in a series of young adult novels. It’s a surname for one of the families in the 39 Clues series of bestselling adventure noels. A minor character in the Batman comics was named Vesper Fairchild. She was a love interest for Bruce Wayne. There’s also a Vesper in Marvel’s Genetix series. Overall, Vesper remains rare. But in our age of Harper, Vivienne, and Stella, it’s a wearable choice. If you’re after something that stands out and fits in, Vesper is one to consider. What do you think of Vesper? 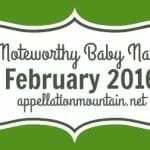 Is this name too Bond girl, or just right for a baby? 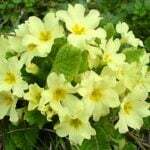 Hetta, I love Vespertine, or Versperinia or Vesperina or Vespera. Let’s not forget about the “Batman comic series as a TV and radio newscaster named Vesper Fairchild, who had a romantic relationship with Bruce Wayne.” – http://www.onceuponatimebabynames.com/2012/12/vesper-vespera-or-vespertine.html . But on a side-note Hespertine, Hespera, HHesperina and Hesperinia would also make great option without having to use the V and still get the same meaning. LOL Kelleita – there is far more to Vesper than I thought at first, too. Is no one else picturing a wee motorbike in their heads the whole time reading this? I love the name and especially the meaning but don’t think I could ever use it, even in the middle. Vesper / Vespa is just too close for me! You’re right, Bevin – though vespa is Italian for wasp. I love Vesper. . . in the middle. a) I LOVE that you used the corect spelling of hiccough! I used it recently and got ridiculed. b) I don’t care much fo Vesper, but you mentioned Seren, and this one is very interesting. Vesper also reminds me of the Vespa, a motor-scooter. If any of you ever read Casino Royale, Eva Green who played Vesper in the movie is Fleming’s physical description come to life! LOL – I’m rather fond of hiccough! I also like doughnut. I’m Catholic – all I can think of is vespers as in evening services thanks to attending Catholic school for a whopping year and a half. I’m glad you’ve added to my knowledge about this name. It is helpful to know it means “evening star”. Since one of Mary’s titles is “Morning Star”, that hopefully helps me to remember the connection should I run into a little Vesper. I can’t decide if that makes Vesper a Very Appropriate Seasonal name or puts her back in the company of Trinity. Yep – indeed it was Lovefeast… complete with the “melt me, mold me, fill me, use me” song, it was outright strange… but the cookies and apple juice made up for it! Vesper makes me think of Moravian Christmas, 007, then the Vespa scooter… unfortunately it doesn’t make for a name that I’d be inclined to use. […] Vesper – She’s a Bond girl, which isn’t necessarily the equivalent of Katniss. […] turned up some gems in 1920s birth announcements.